Looking for unique teaching and learning experiences at VWU? You'll find it here at the INTEL Center. At Virginia Wesleyan University, our goal is to develop each student through a rigorous educational experience in the classroom, on the campus, in the community, and in the world. Innovative Teaching and Engaged Learning (INTEL) is a signature of the transformational educational experience we provide for students. In brief, it is a way of approaching education that emphasizes using varied and creative ways (innovation) to teach course material and encourage active student involvement (engagement) in learning. INTEL doesn’t mean professors no longer lecture; they often still do lecture because that can be the best way to deliver certain course material. What it does mean is that faculty and students TOGETHER delve into course material in ways intended to encourage increased knowledge, deeper learning and understanding, critical thinking, and application. The Center for Innovative Teaching and Engaged Learning (the INTEL Center) provides leadership and support for new academic initiatives and faculty development that promote our strategic institutional commitments to students' intellectual inquiry, active learning and civic engagement. 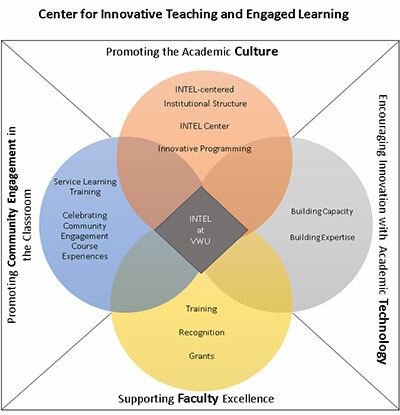 For more information, please contact Denise Wilkinson, Associate Dean for Innovative Teaching and Engaged Learning.